Did you ever find something you didn’t know you were missing? Like a dollar bill? That spare key to the boat house? Or your old copy of Fire and Bronze? Well, that’s Ostia. This was one of Rome’s primary ports along the mouth of the Tiber, a sizable city that was doing just great until 500AD or so, when the river suddenly moved away. Commerce dried up, everyone moved on, dirt blew up around that walls and the city was largely forgotten. Now recent excavations of unearthed an entire Roman city, its bath, amphitheater, its market, its apartments and shops. 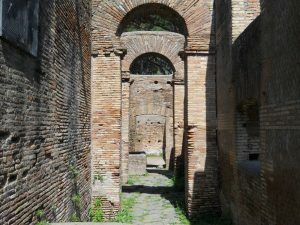 You can walk pretty much down its silent streets, seeing things as they were (well, without furniture, wall plaster, household items and Romans). But its still fascinating. We spent all day there. 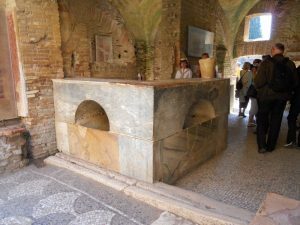 Most interesting to me was the preserved wine shop with its counter and hearth. 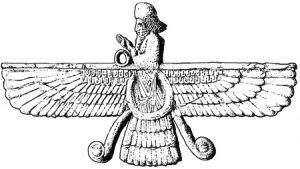 It was eerie since Early Retyrement, my upcoming kindle book, deals with a modern fellow who falls back in time and ends up working in a wine shop in 300BC. It was like walking onto the set of a movie – this was just how I imagined it would be. Hats off to my clever sister who suggested picking up picnic supplies at Termini and porting them in. While everyone overran the restaurant, we had sandwiches, cookies and dates on a sheltered bench overlooking the ruins. We stayed until about 4pm or so, then rode the train back to Rome. Since there is work taking place on the underground red line and it shuts down early every night except Saturday, this was the night we saw the amazing Trevi fountain. You’d think something as garish as this, lit up as crazy as this, would be as attractive as one of those overdone Christmas displays but no, it was very beautiful. JB and I tossed our coins in (then my sister pointed out that it’s over the shoulder, so good money after bad). First, we ordered a bottle of wine and three glasses and damn near got three bottles. Then they brought the wrong meal to JB (upturned crawfish in spaghetti – ugh), and when this was pointed out to them, they lifted the plate from our group and carried it directly to the proper table. They forgot my second course, then lied that it was “almost ready”. When it did come, there was more fat on it than a liposuction. And when my sister complained about the overall everything of it, all the waiter could do was play the role of Manuel from Fawlty Towers, telling us how he’d only just come to this country, didn’t know the language and hadn’t gotten any training at all. It would have been funny had it not been so bloody expensive. 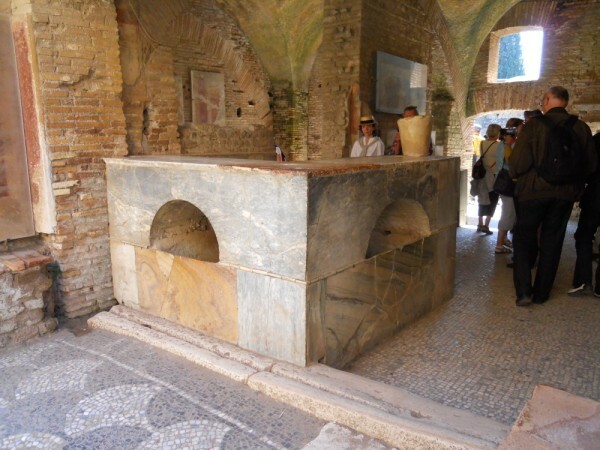 Still, Ostia made the day, so we were well in the black, enjoyment-wise.